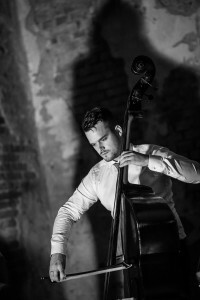 The double bass quartette BassBand is one of the configuration, which uprised very unwillingly by the activities of the civil union Slovak Double Bass Club. 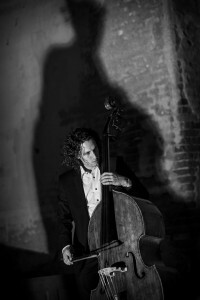 Its ambition it to show to the listeners the possibilities, how to use the double bass not only as an orchestral music instrument, but as a sole music instrument too. 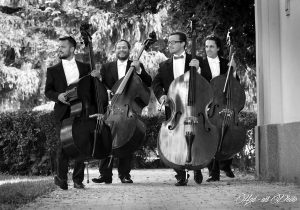 The double bass quartette supplies a scarce experience in the connection with the sound of the deepest clanging stringed instrument for the listeners in a scarce arrangements of a classic music, a jazz, a swing to a popular music. The ensemble is specializing in a introducing of a primal and orginal music songs, which were created for this scarce confirguration, from the authors of world and domestic music scene (S. Palúch, M. Comendant, M. Lejava, L. Chuťková, P. Bodnár, J. Gréner, H. Nuegebauer, R. Catalá, V. Jaš, J. Borza), by the introducing of arrangements and transcripts of a stringed quartettes (W. A. Mozart Divertimento D- major, L. van Beethoven – piano sonata Nr. 9. op. 14, G. Ph. Telemann – Concerto in D major), the wind instruments configurations and many others. The BassBand has a lot of a successful project and productions of the original and new song for this scarce configuration times over. 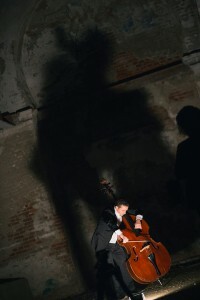 They produce more interesting projects, with prominent Slovak artist: Martin Babjak, solois of Slovak National Teater, Mária Čírová – slovak young popular singer. Or prominent dance and “rap” group “Regiment”. In the year 2015 BassBand produce their firs debut CD BassBand. BassBand supplies a rank of programms and projects, which are built-up beskope. It is the only one music configuration on the Slovak music scene, which is addicted to a promotion of this literature.